A pedestrian is killed by a car roughly every 90 minutes in the United States. And until this week, all of those drivers were human. 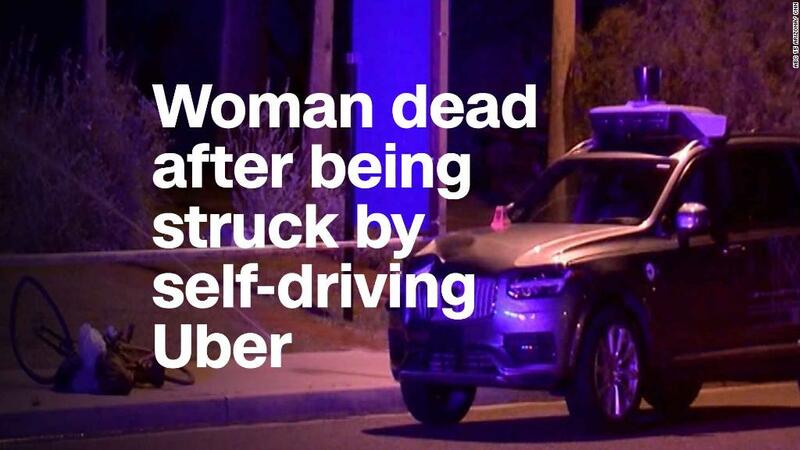 Then 49-year-old Elaine Herzberg was struck and killed by a self-driving Uber in Tempe, Arizona on Sunday night. But self-driving cars don't pose any more of a risk to pedestrians, bicyclists or other cars than cars piloted by humans. Self-driving cars have already been put through millions of miles of road tests, and experts say that the technology clearly has the potential to be safer than human drivers. Indeed it could save a huge number of lives if or when it becomes widely adopted. There were an estimated 40,000 traffic fatalities on US roads last year, according to the National Safety Council, and more than 90% of them were caused by human error. "Human drivers aren't that safe," said Lionel Robert, a professor at the Robots Institute at the University of Michigan. He said the goal is not to make self-driving cars as safe as human drivers. "We want self-driving cars to be safer," he said. In difficult conditions, such as limited visibility or on bad roads, an experienced human driver may have an edge over self-driving cars using today's technology, said Bart Selman, professor of computer science at Cornell University. But he expects that self-driving cars will eventually be much safer. "They look around the car 360 degrees. They're able to take in way more information than a human driver and they don't get distracted," said Selman. Self-driving cars are actually better than humans at obeying traffic laws. They don't drive drive too fast. They don't text and drive. They don't drive drunk. They don't fall asleep and drift into oncoming traffic. That alone makes them safer drivers than humans, said Mike Ramsey, director of research at Gartner. Selman and Robert both say that Sunday's accident, as tragic as it was, will help improve self-driving safety. By studying what happened, developers can improve the technology used to avoid pedestrians. "You can make all the predictions you want, but you learn from actual experience," said Robert. "You need systems to be tested out on the road." Self-driving cars are very good at detecting and avoiding obstacles, Selman said. But teaching a car to anticipate that a pedestrian might step in front of it is still one of the most difficult things to do, according to the experts. Uber has put testing its self-driving cars on hold while the investigation is completed, and Toyota (TM) also halted road tests of autonomous cars. The cause of the accident Sunday has yet to be determined by police. The National Transportation Safety Board, which typically investigates plane crashes and train accidents but not car crashes, is also investigating. "No one ever said all accidents are preventable," said Ramsey. "Nevertheless, it raises questions. We need to make sure these systems are working correctly." --CNN's Peter Valdes-Dapena and Matt McFarland contributed to this story.